News4's cameras were rolling as accident after accident occurred along the BW Parkway in Prince George's County Friday. What made these incidents stand out was that they were reported during the afternoon, as temperatures climbed into the 40s and 50s. Lanes went untreated, and police even closed down part of the highway between MD 410 and the US 50 split due to the dangerous conditions. After crashing into the car in front of her along BW Parkway just after 1 p.m., Siedah Rush said the accident was preventable. "He couldn't stop, I couldn't stop," Rush said. "I had more than enough time but because of the snow and the ice, I couldn't stop in time." In a statement, Ian Glick with the U.S. National Park Police told News4 the organization failed in properly treating BW Parkway before, during and after the storm. 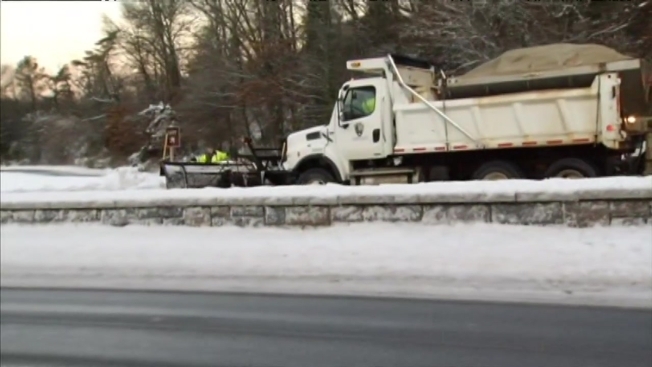 "[It] has failed to secure the necessary equipment, sufficient personnel and salt to ensure that the Baltimore Washington Parkway is open and safe for the public to use," he wrote. According to Jennifer Mummart with the National Park Service, BW Parkway was treated, but improvements continue to be made to clean up the ice and snow. "We had crews out plowing, widening lanes and shoulders, so we continue to work to improve the situation," Mummart said. "I know there were some discrepancies on what we were treating with."